Most people select colors with an eye toward coordinating rooms with things already prized-possessions like furniture, antiques, and artwork. But color can come first. In fact, the restriction of working with five colors from Traditional Home's new paint palette shaped solutions for designer Jack Levy. Jack fingers chips in shades of rust; green, and an odd pink. "I fell in love with this pink flying over the Grand Canyon en route to Las Vegas a few weeks ago," he says. "I lost $300 but found a great color, Canyon pink." Coincidentally, he found the same color in a French Impressionist painting he owns but had relegated to the back of his closet. It seems that rediscovery has as much promise as novelty in color choices. With the proponent use of bold color, Jack offers a couple of suggestions: It often works to put a bit of bright color in a stairwell, a vestibule, a hallway, or other small, defined areas. It gives the lift of bright color without making the whole room too vivid. Jack also uses liberal color on accessories. The leather boxes turn chocolate brown and likewise, Lucite boxes on the mantels switch from primary red to cool khaki. The finesse involved in mixing traditional and modern, high-gloss with something more laid back is as much about nuance as good taste. Jack's decor uses compelling and subtle colors, a palette that doesn't stray far from the sandy, army green, and rust colors seen around his Texas hometown. He relies heavily on the freshness of juxtaposition. A khaki-colored acrylic box sits before utilitarian linen sheers paired with silk taffeta curtains. A traditional Tibetan rug embodies modern geometry. Swedish chairs, 19th-century reproductions, share the spotlight with a glamorous '40s-style etagere and a club chair covered in a contemporary weave. Jack Levy doesn't believe in using vivid color to reinvent rooms. Jack tends to work in softer hues. "I grew up in Texas, where things are sandy, green, mocha brown, rust, soft brick, and pale olive." These easy-to-live-with colors highlight people's furnishings, as well as their faces, he says. 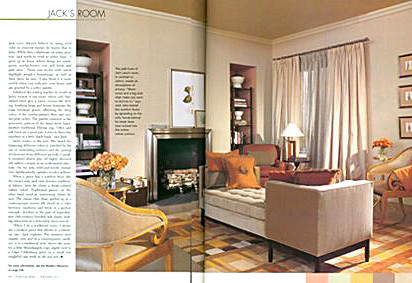 "I also think it is more restful when you walk into your home and are greeted by a softer palette." Subdued decorating reaches its zenith in Jack's version of our room, where rich, burnished tones give a warm, cocoon-like feeling. Soothing beige and brown dominate the main furniture pieces, offsetting the deep colors of the mocha-painted floor and suntan-pink niches. The palette coalesces in the geometric pattern of the hand-dyed, hand- knotted traditional Tibetan rug. "Olive and soft brick are a great pair I refer to them like numbers in a little black book," says Jack. Jack's metier is the mix. His knack for balancing different colors is matched by his use of contrasting textures and the pairing of elements from different periods. Casually wrinkled sheers play pff highly sheened silk taffeta curtains in an understated interlude. On the sofa, wild-and-woolly mohair trim lightheartedly updates woolen pillows. When a piece has a moderubent, like the room's sofa, Jack uses dressier traditional fabrics; here he chose a khaki-colored cotton velvet. Traditional pieces, on the other hand, need an "interesting" fabric, he says. The classic club chair spiffed up in a contemporary woven silk check in a color between cranberry and brick, is a perfect example. Another is the pair of reproduction 18th-century Swedish side chairs, looking tailor trim in a delectable linen tweed. "When I do a traditional room, I always use a modern piece that alludes to a historical one," Jack explains. The stainless steel mantel; new and in a contemporary medium, is in a traditional style. Above the mantel, a little Michelangelo copy alights next to a Claes Oldenburg print in a small but insightful case study of old and new.